First Aid is the help given to an injured person before medical treatment can be obtained. Mental Health First Aid is the help given to someone developing a mental health problem or in a mental health crisis. The first aid is given until appropriate professional treatment is received or until the crisis resolves. 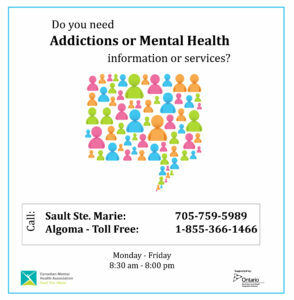 For more information or to register for the next course, please call Central Access and Information at 705-759-5989. Please click here to learn more about how to promote mental health in your workplace. If you are interested in booking a training at your workplace, please call the Mental Health Educator at 705-759-0458 ext. 231.